Home Agriculture American Agriculture American Farming barley cereal combine. Corn Farming soybeans Wheat "Why are your crops dead?" "Why are your crops dead?" I love it when I get to blog about real questions that real people ask me about farming. The other day, someone ask me why we wait until our crops are dead to harvest them. I had to think about what she meant before I could answer. I asked "What do you mean?" She replied "You know, how they all turn brown and die and then you harvest them." I think she means corn that looks like this. Or soybeans that look like this. I understand the confusion. Most people who garden don't wait till their plants are dead to harvest the produce... but most people who garden do not grow grain. Grains or cereal crops are the "amber waves" of grain sung in "America the Beautiful". 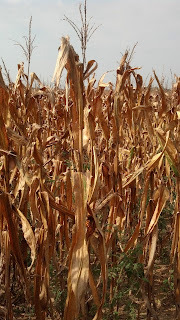 These crops may look "dead", but are actually "ripe" which is a better term than dead, and ready to be harvested. Grain crops like corn, soybeans, wheat, barley, sorghum and others are harvested when ripened and for those plants, ripening means they have dried down and their green tissue has turned brown. Since these crops have a long storage life, they must be low in moisture in order to be held in large grain bins without going moldy. They have to be dry in order to have any shelf life for future use in a food or feed product. Consumers don't want moldy grain in their food, nor do animals care for moldy grain in their feed, not to mention the health risk to both if moldy grain is consumed by either. 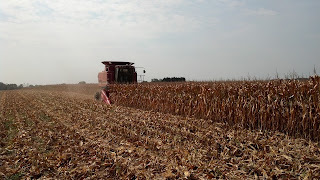 In our combine, we have a monitor that tells us how many bushels per acre we are harvesting, how many acres we have harvested, and what the moisture content is of the grain we are harvesting. If we harvest grains that are too high in moisture and deliver them to a grain elevator, we get "docked" or penalized for high moisture content. We try to harvest at the right moisture level but occasionally have to run grain through a grain dryer to lower the moisture before we sell it. Drying grain gets expensive so we do our best to harvest at the right moisture. Right now, corn is running 14-18% moisture. We get docked if the moisture is over 15.5%. We grow 104 - 112 day corn which means we can stagger our harvest dates over time so that the corn does not ripen all at the same time. This helps us plan the demand on our farm equipment and manage our resources more efficiently. Soybeans must be under 13.5% moisture. 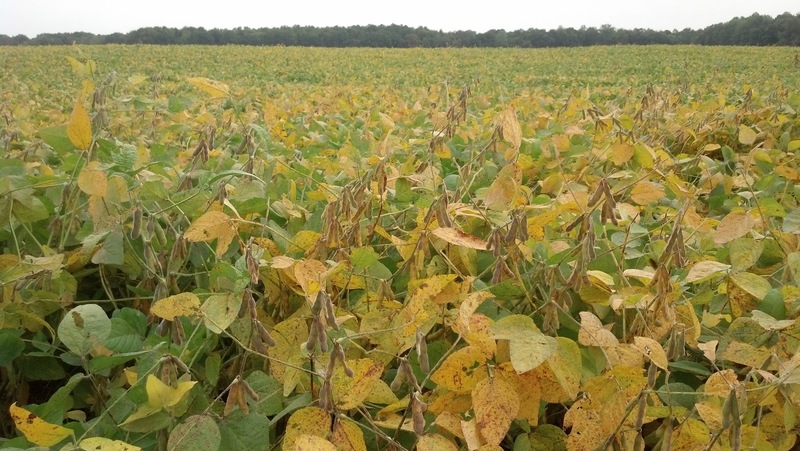 Right now our soybeans look like this picture above. Soybeans are grouped into 13 different maturity groups, based on their adaptation to the climate and latitude. We grow late Group 3 to some early Group 5 soybeans. 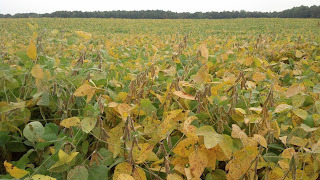 These beans are just starting to turn yellow and approach what we call "leaf drop stage" when the leaves turn brown and drop off, sort of like the first soybean picture above. Because of the high humidity and risk of hurricanes in our region, we harvest corn first and soybeans last. Last year, besides the drought, Hurricane Isabel flattened our irrigated corn, so between the drought and the hurricane of 2011, it was one of our worst years on record. In a good year, we will be harvesting soybeans through the end of November or early December because of a large crop to bring in. If we finish by Thanksgiving, we've had a not-so-good year, meaning there wasn't much to harvest. And so now you know why grain crops turn brown... in case you ever wondered.